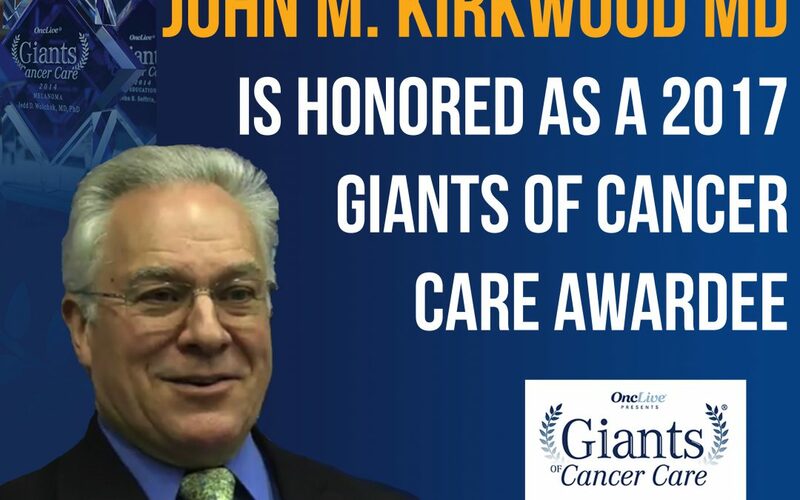 John M. Kirkwood MD has been inducted into the 2017 Giants of Cancer Care recognition program. The honor recognizes healthcare professionals who are advancing the field of oncology through their research and clinical practice. The program is sponsored by OncLive, the official website for the Oncology Specialty Group, which publishes OncologyLive, Urologists in Cancer Care, Oncology Business Management, and Oncology Nursing News. Dr. Kirkwood is the Usher Professor of Medicine, Dermatology and Translational Science and Director of the Melanoma and Skin Cancer Program, University of Pittsburgh School of Medicine. A renowned researcher in the field of melanoma, he has pioneered the development of cancer immunotherapy for 45 years. Currently, he is developing combinations of new immunotherapies and molecular therapies that are expected to be focus of clinical translational research over the next 10 years.